My brother-in-law in law Mark loves fishing. So it was with anticipation that we’d get to experience some time on/near the water during our weekend in Victoria. I knew I’d probably make 1 dinner over the 2 nights we were there, so I planned a menu around this thought. I wanted to prepare something good for the soul, and hopefully leave Mark with a recipe he could re-create, so I chose paella! 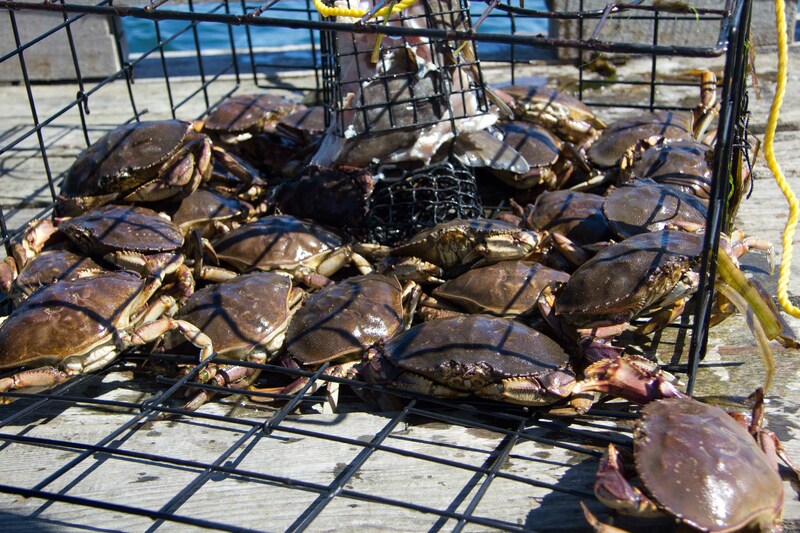 We arranged an outing to Sooke to do some crabbing off the docks on Saturday afternoon. Our first stop was at Finest at Sea for some fish trimmings and of course I had to buy some road snacks. 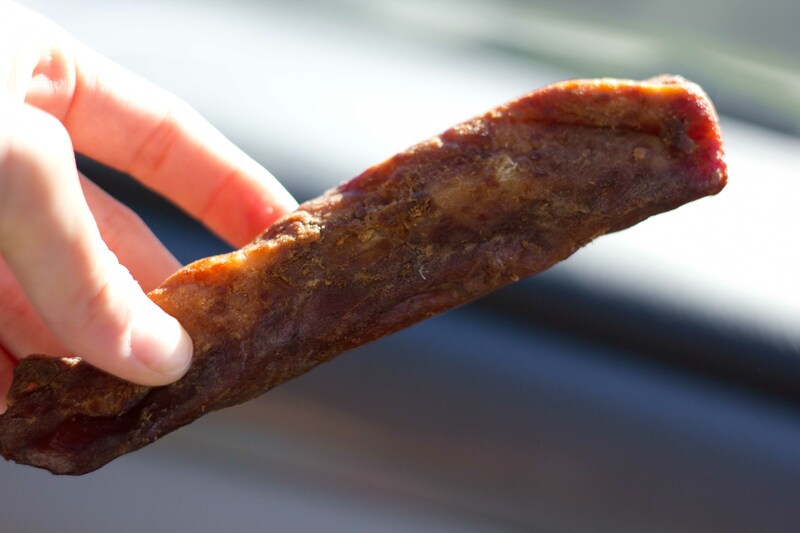 Albacore tuna teriyaki strips are a perfect road snack! 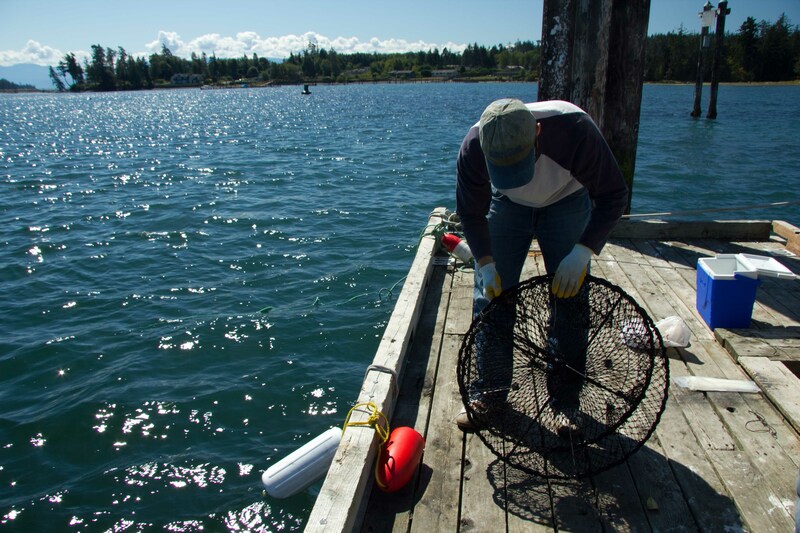 We got to Sooke and Mark started laying out the traps. 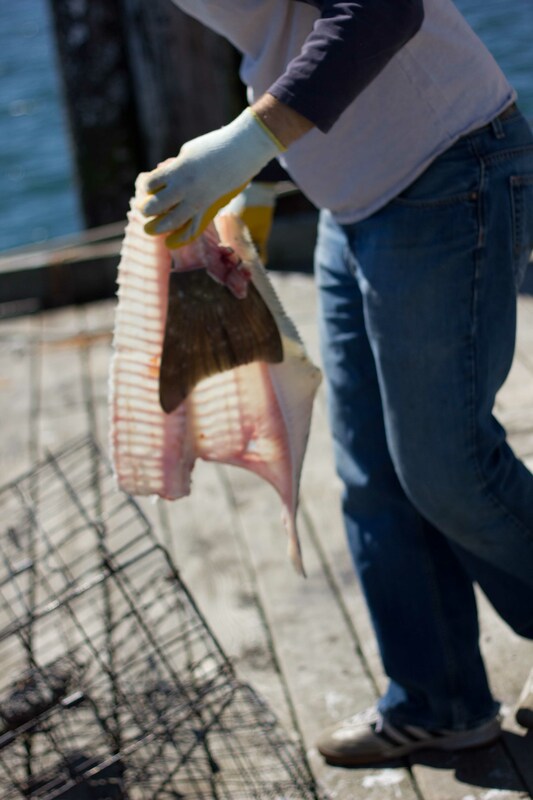 Halibut trimmings for bait. Apparently it’s 4:1 more effective than salmon trimmings! 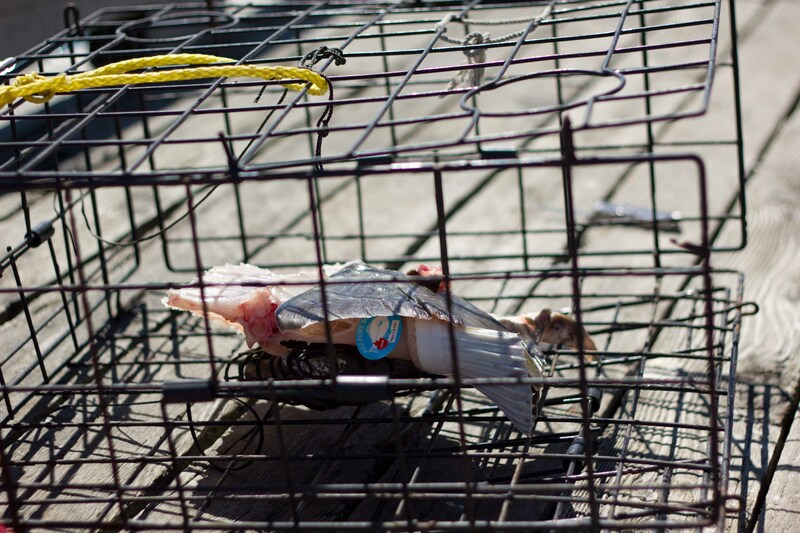 Crab trap baited and ready to go in. Prepping the prawn trap. Fingers crossed! Unfortunately most of the crabs were females or undersized and we were completely out of luck when it came to getting any prawn/shrimp. We did get 3 keepers though and luckily we were able to add to the meal with some prawns in the freezer from a few weeks back when Mark & Ben went out had a successful day of prawning. 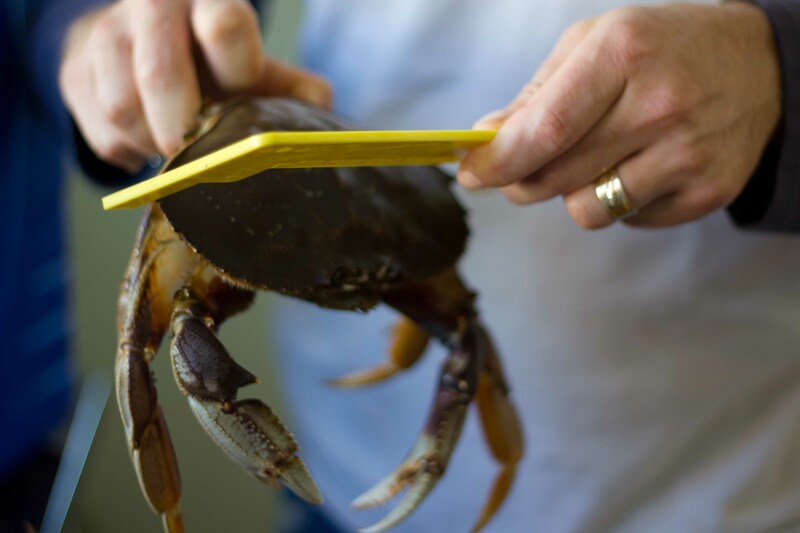 Calibration to make sure the crabs are of legal size. With help from my sous-chefs, we boiled and shucked the crab and got all of the other seafood ready. I went a bit overboard on the seafood selection, but I wanted this paella to be special. I would have normally kept the heads on the prawns, but they were leaking black liquid out, so I thought I should discard them. I heated the paella pan with olive oil and quickly seared the prawns. Less than a minute on each side is enough to flavour the oil. So quick in fact that I wasn’t able to get a photo of them in the pan. 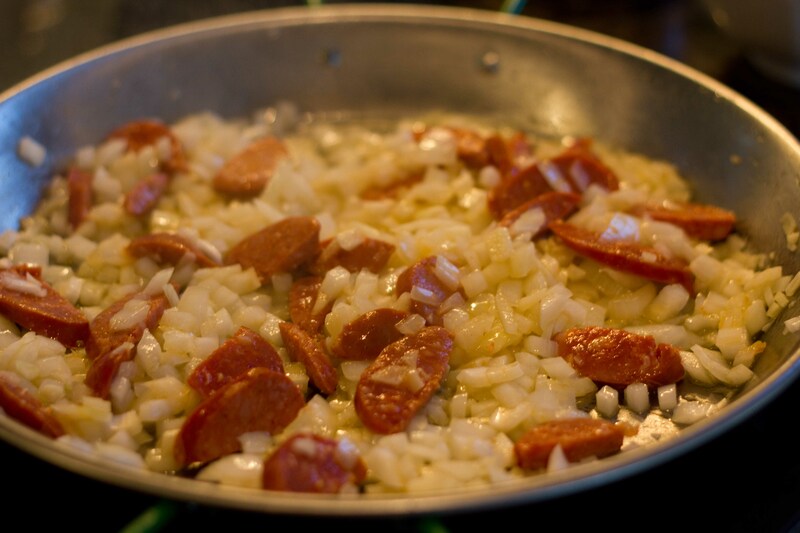 Then it was time to sauté some onion and chorizo. My sister-in-law Megan doesn’t eat pork, but was ok with me using it in the dish. Because I wanted her to be able to pick the pieces out, I kept the chorizo slices a lot bigger than I would normally would have. Sauteing onions, chorizo and garlic. This made the house smell wonderful! I’m a stickler for proper doneness when it comes to food. Although the recipe calls for the things to be added in order and left in during the whole cooking process, I find that I add things in, cook it just right and then take it out and leave it on the side. It makes the preparation a bit more time-consuming, but it’s worth it in the end. 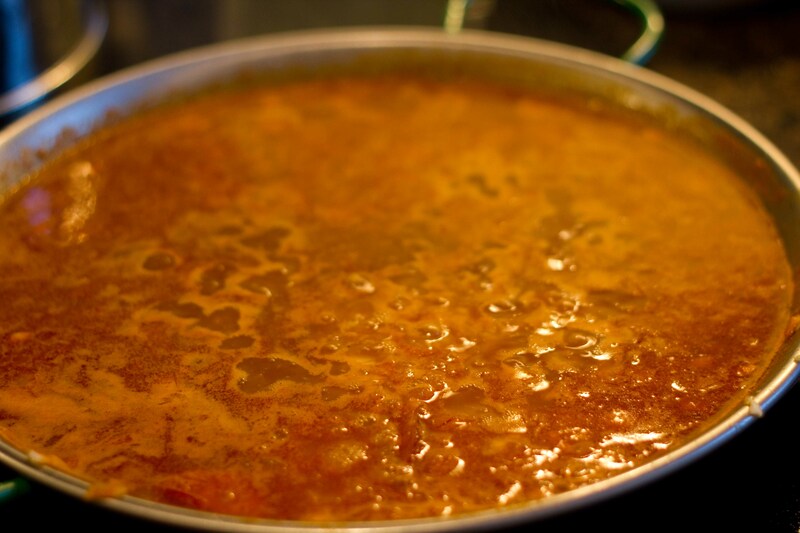 Add puréed tomato, fish stock, sweet pimentón, saffron and cuttlefish to the pan and bring to an angry boil. After 5 minutes you add the rice. It’s hard not to want to stir the rice, but you must not! Start adding in your fish when the rice looks close to done. This is where my timing goes off, as I end up adding the fish too soon and then taking it out again because the rice isn’t ready. All the liquid will eventually absorb and you’ll hear the pan crackling, (which is a good thing and something that I’m too impatient to wait for). When it’s done put back all the lovely chorizo and seafood. 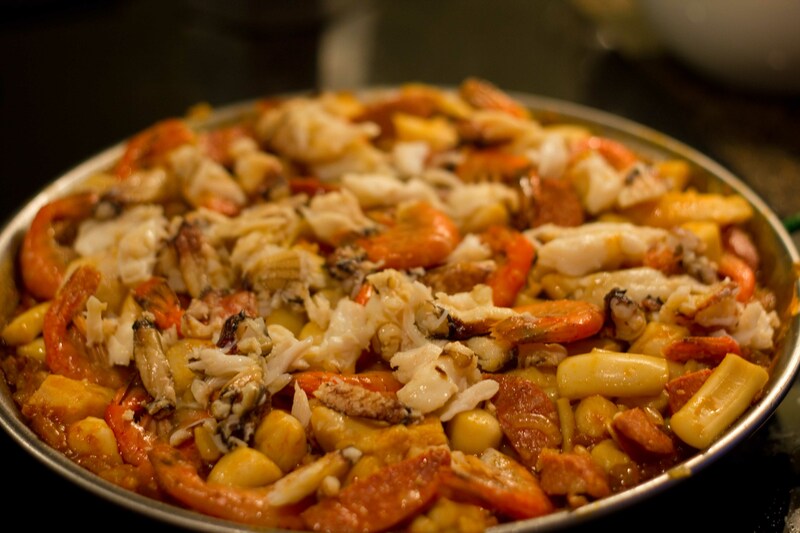 Wait a few minutes for the seafood to warm up and then ENJOY! MARK’s CATCH OF THE DAY PAELLA From Spain on the Road Again, with my own adaptations. 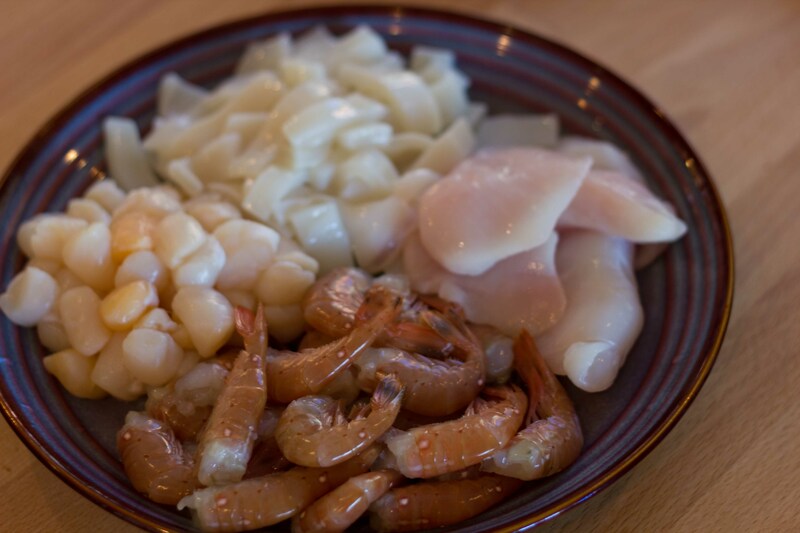 1-2 pounds of assorted fish, shellfish, or even chicken thighs if you want. Pre-heat a 14- to 18-inch paella pan over medium-high heat. Add the oil and heat until smoking. 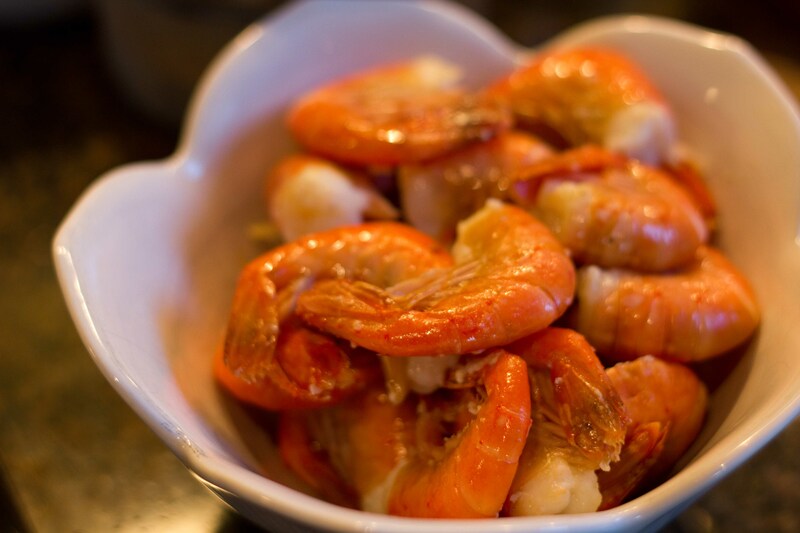 Add the prawns and cook until golden brown on both sides, about 1-2 minutes per side . Transfer to a plate and set aside. Add the onion, (and chorizo or chicken thighs if using) to the pan and cook until soft, about 8 minutes. Add the tomato puree, stirring it into the onions, and cook for 3 minutes. Add the salt, saffron, pimentón, and squid and cook, stirring, for 5 minutes, or until the squid firms up slightly. Add the stock, bring to a boil, and cook for 5 minutes. Add the rice and stir well to distribute it evenly. I take the squid out at this point. Bring the stock to a boil, and cook, without stirring, for 10-15 minutes. As the liquid starts to absorb, start introducing the fish you’re using, trying to gauge the amount of time it will take to cook. The rice still needs 10-15 minutes to cook. 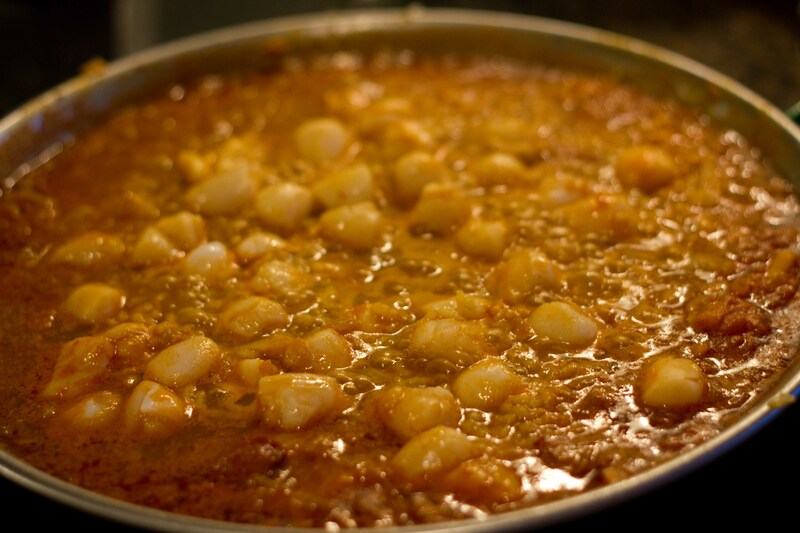 Reintroduce shrimp to paella, taste for salt and add it if needed, then cook until the liquid is almost completely absorbed and the pan starts to make a crackling noise (don’t worry, this is what you want). Remove from the heat and let rest for 10 minutes before serving. 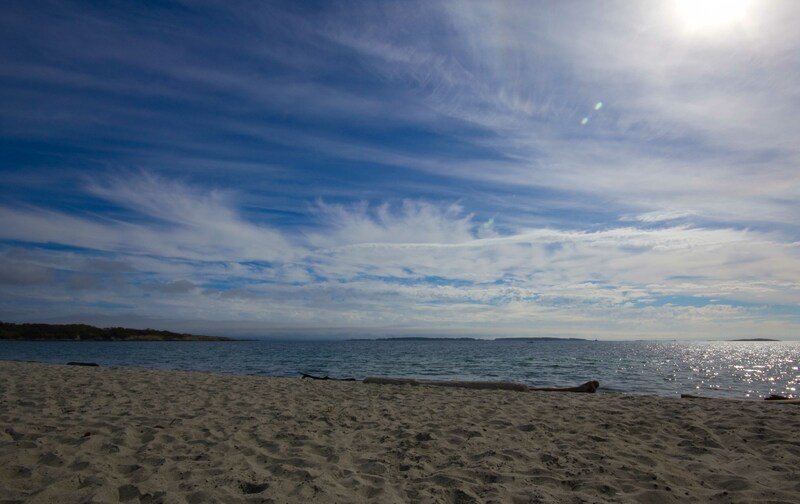 The beautiful beach in Oak Bay. 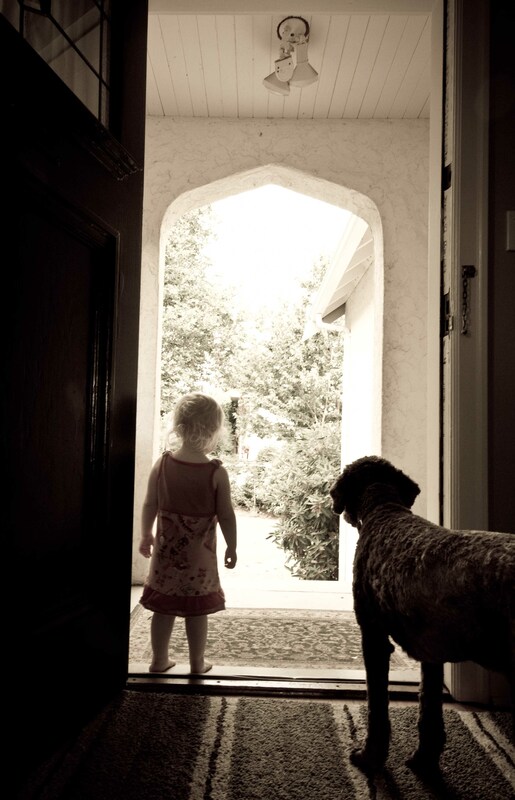 My niece and her dog Bodhi patiently waiting for dad to come home. Reading the paella recipe is making my mouth water. I am so looking forward to making this dish soon! Writing it made my mouth water too. So much so I’m craving it again!